Kamen Rider Gaim will be teaming up with another hero for a crossover this May. However, instead of the ToQgers, Gaim will be teaming up with Kikaider, serving as a promotion for the upcoming Kikaider REBOOT movie. Kikaider is a special type of robot, built with a conscience circuit which allows him to feel human emotions and know right from wrong. He’s usually seen in his human alter-ego, known only as Jirō. But when the need arises, he can transform into his blue and red robot form. In the crossover, Kikaider ends up in Zawame City and quickly befriends Kōta. He explains that he’s here to defeat the evil robot Hakaider who has been created to destroy him. 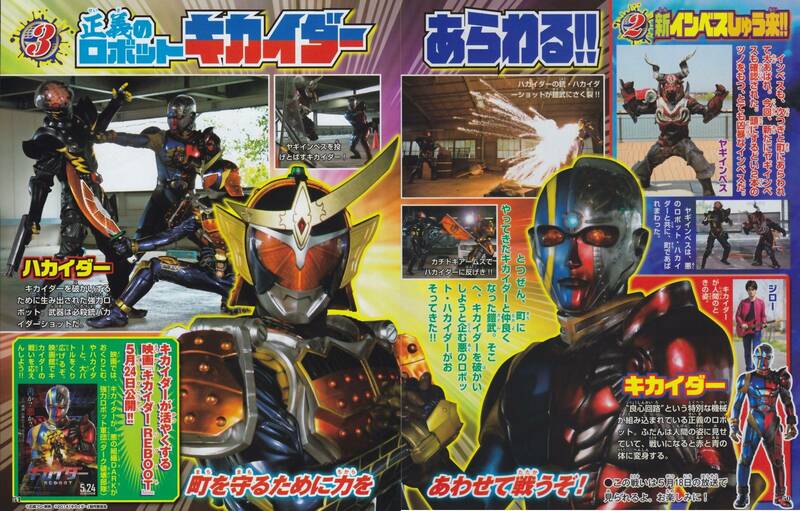 Hakaider is seen working together with the Goat Inves for an unknown purpose. The crossover episode will be written by Gaim’s Nobuhiro Mōri, and is set to air May 18th, one week before Kikaider REBOOT premieres on the 25th. Reblogged this on Trapped in a State of Imaginary Grace.